Was our solar system visited (in 2017) by a probe sent by an alien civilization? Astrophysicist Avi Loeb (from Harvard University in Cambridge, MA) explains why it is possible, in the January issue of the German magazine Der Spiegel. 1 The Intruder On October 19, 2017, the Pan-Starrs Telescope in Hawaii discovered a strange elongated cigar-shaped celestial body. It moved so fast that it could not be part of our solar system. It had to be a foreign object, and was called ‘Oumuamua (Hawaiian for ‘First Messenger from Afar’). 2 Strange Coincidence It is comparatively rare that asteroids from distant star systems get lost in our solar system. According to Loeb, the likelihood of seeing such asteroids through Pan-Starrs is somewhere between 1 in 100 and 1 in 100,000,000. 3 Flashes The brightness of ‘Oumuamua fluctuates: the object rotates and reflects, due to its special shape, different amounts of sunlight. The effect is so pronounced that ‘Oumuamua would have to have a bizarre, elongated form – something which does not occur in celestial bodies of our solar system. 4 Enigmatic Trajectory ‘Oumuamua shows a trajectory departure from that known for comets that leave a trail of gases (typically surface ice that evaporates). Also, neither a comet tail could be observed, nor did the rotation of the object change, as would be expected with loss of mass due to gas emissions. 5 Not Solar Powered For Avi Loeb, the only other assumption could be that the solar power (radiation pressure) affected the trajectory of ‘Oumuamua. However, this force is so weak that it could only affect bodies with a large surface area and tiny mass, such as a paper-thin sail. 6 Not Space Junk If such an artificial light sail or other object reached our solar system by accident, one would have to assume that in space such foreign artefacts would abound (which is not the case). So this possibility also seems unlikely. 7 Alien Mission Loeb therefore suspects that an extraterrestrial civilization has purposefully sent ‘Oumuamua as an exploratory probe in our solar system. 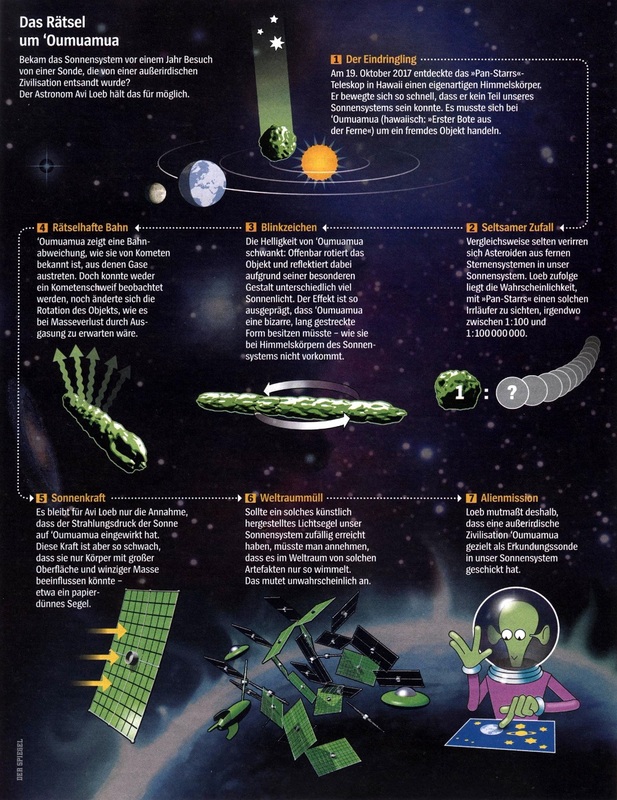 The mystery of ‘Oumuamua, explained with pictures in the Jan 5, 2019 issue of Der Spiegel.